This article is about infinite geometric series. For finite sums, see geometric progression. Each of the purple squares has 1/4 of the area of the next larger square (1/2×1/2 = 1/4, 1/4×1/4 = 1/16, etc.). 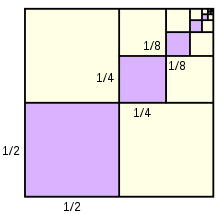 The sum of the areas of the purple squares is one third of the area of the large square. is geometric, because each successive term can be obtained by multiplying the previous term by 1/2. If r is between −1 and +1, the terms of the series approach zero in the limit (becoming smaller and smaller in magnitude), and the series converges to a sum. In the case above, where r is 1/2, the series converges to 1. If r is equal to one, all of the terms of the series are the same. The series diverges. If r is minus one the terms take two values alternately (e.g. 2, −2, 2, −2, 2,... ). The sum of the terms oscillates between two values (e.g. 2, 0, 2, 0, 2,... ). This is a different type of divergence and again the series has no sum. See for example Grandi's series: 1 − 1 + 1 − 1 + ···. The sum of a geometric series is finite as long as the absolute value of the ratio is less than 1; as the numbers near zero, they become insignificantly small, allowing a sum to be calculated despite the series containing infinitely many terms. The sum can be computed using the self-similarity of the series. A self-similar illustration of the sum s. Removing the largest circle results in a similar figure of 2/3 the original size. A similar technique can be used to evaluate any self-similar expression. the left-hand side being a geometric series with common ratio r.
The formula also holds for complex r, with the corresponding restriction, the modulus of r is strictly less than one. Since (1 + r + r2 + ... + rn)(1−r) = 1−rn+1 and rn+1 → 0 for | r | < 1. That is, a repeating decimal with repeat length n is equal to the quotient of the repeating part (as an integer) and 10n - 1. 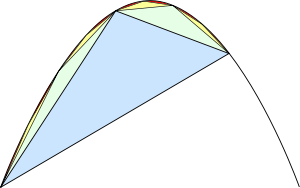 Archimedes used the sum of a geometric series to compute the area enclosed by a parabola and a straight line. His method was to dissect the area into an infinite number of triangles. Archimedes' Theorem states that the total area under the parabola is 4/3 of the area of the blue triangle. Archimedes determined that each green triangle has 1/8 the area of the blue triangle, each yellow triangle has 1/8 the area of a green triangle, and so forth. This computation uses the method of exhaustion, an early version of integration. Using calculus, the same area could be found by a definite integral. The interior of the Koch snowflake is a union of infinitely many triangles. In the study of fractals, geometric series often arise as the perimeter, area, or volume of a self-similar figure. 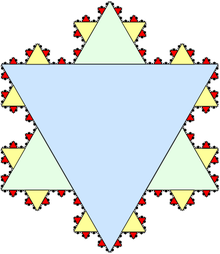 Thus the Koch snowflake has 8/5 of the area of the base triangle. Book IX, Proposition 35 of Euclid's Elements expresses the partial sum of a geometric series in terms of members of the series. It is equivalent to the modern formula. In economics, geometric series are used to represent the present value of an annuity (a sum of money to be paid in regular intervals). is the yearly interest rate. = 0.10), then the entire annuity has a present value of $100 / 0.10 = $1000. This sort of calculation is used to compute the APR of a loan (such as a mortgage loan). It can also be used to estimate the present value of expected stock dividends, or the terminal value of a security. ^ "Euclid's Elements, Book IX, Proposition 35". Aleph0.clarku.edu. Retrieved 2013-08-01. ^ Taylor, Angus E. (1955). Advanced Calculus. Blaisdell. p. 603. Abramowitz, M. and Stegun, I. A. (Eds.). Handbook of Mathematical Functions with Formulas, Graphs, and Mathematical Tables, 9th printing. New York: Dover, p. 10, 1972. Arfken, G. Mathematical Methods for Physicists, 3rd ed. Orlando, FL: Academic Press, pp. 278–279, 1985. Beyer, W. H. CRC Standard Mathematical Tables, 28th ed. Boca Raton, FL: CRC Press, p. 8, 1987. Courant, R. and Robbins, H. "The Geometric Progression." §1.2.3 in What Is Mathematics? : An Elementary Approach to Ideas and Methods, 2nd ed. Oxford, England: Oxford University Press, pp. 13–14, 1996. Pappas, T. "Perimeter, Area & the Infinite Series." The Joy of Mathematics. San Carlos, CA: Wide World Publ./Tetra, pp. 134–135, 1989. Andrews, George E. (1998). "The geometric series in calculus". The American Mathematical Monthly. Mathematical Association of America. 105 (1): 36–40. doi:10.2307/2589524. JSTOR 2589524. C. H. Edwards, Jr. (1994). The Historical Development of the Calculus, 3rd ed., Springer. ISBN 978-0-387-94313-8. Weisstein, Eric W. "Geometric Series". MathWorld. Casselman, Bill. "A Geometric Interpretation of the Geometric Series". Archived from the original (Applet) on 2007-09-29. "Geometric Series" by Michael Schreiber, Wolfram Demonstrations Project, 2007.